The head of Nigeria's national oil company has said it paid millions of dollars to militants to protect the country's oil infrastructure. Abubakar Yar'Adua of the Nigerian National Petroleum Corporation (NNPC) made the comments to a national assembly committee. He later said he had been misunderstood, and that no money was paid to the rebels. A militant group responded by saying they would blow up the pipeline. The Movement for the Emancipation of the Niger Delta (Mend) issued a statement claiming they had nothing to do with the alleged deal. "To prove we were not part of the deal, the Chanomic Creek pipeline and other major pipelines will be destroyed within the next 30 days," the group said in an e-mail sent to journalists. On Wednesday, public hearings began in a previously scheduled national assembly investigation into corruption in the petroleum sector. It was the first time the NNPC had appeared to acknowledge paying militants. In recorded comments heard by a BBC reporter in Abuja, Mr Yar'Adua told the parliamentary committee that rebels had asked for a $6m monthly fee, telling them to "take it or leave it". "You have to pay, that's the truth," he said. He was also quoted in local newspapers as saying that the company decided to pay up to protect oil facilities sabotaged by militants after it lost $81m worth of oil in two months. "The price we pay is very high. 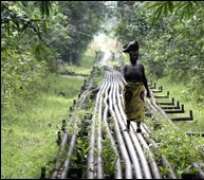 It is difficult to get expatriates to work in the Niger Delta," Mr Yar'Adua was quoted as saying in the Guardian newspaper. "We paid militants $12 million because we were losing $81 million to the problem of the Chanomic pipeline in Delta State." It has long been suspected by human rights activists that the NNPC has been paying militant groups in Nigeria's oil-rich Niger Delta to stop their activities. Mend's spokesman Jomo Gbomo said the payments had been made to a "criminal gang". "This criminal gang is not a genuine part of the Niger Delta agitation for justice but a front. They cannot be labelled as militant freedom fighters." Attacks on Nigeria's oil infrastructure have cut oil production by about a quarter. Mr Yar'Adua's remarks were made at an investigation into missing money ministries were meant to have remitted back to the Federal Government from their budgets last year.